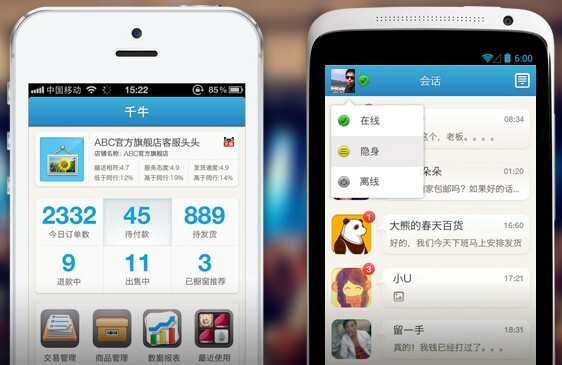 Qianniu is a mobile app for e-commerce sellers on Taobao, Tmall and 1688.com to organize online stores. It enables sellers to do almost everything they are doing on PC. Versions for iOS, Android and Aliyun OS — the custom Android system by Alibaba– are available. Starting beta testing in the past February, it has had about a million installs and half a million active users. Sellers can organize sales and inventory, do customer support and see data in one place with a smartphone. The dashboard shows the number of daily orders, goods to deliver, refunds, inventory, impressions of ads, etc. Wangwang, the IM tool developed by Alibaba, is integrated into it. A analytic service is also included to show metrics of visitors, sales, etc. Previously retailers on Alibaba platform have to open seller’s home, Wangwang for sellers, e-CRM and other separate services to do all the above-mentioned things. Qianniu also supports multiple user accounts so that a store with more than one staff that can manage the store together. Alibaba is also developing a Web version of Website of Qianniu, with which it hopes to build it into a collaboration platform. Other services for sellers such as Jushita, the cloud-based service platform, will be added onto Qianniu, according to Wang Wenbin, VP of Seller Service of Alibaba Group (in Chinese).